A Swamp full of Dollars by Michael Peel - was one of the books in focus in the 2011 Garden City Literary Festival. Peel introduces readers to Nigeria’s oil-rich Niger Delta with an uncommon insight. This is made possible by his interaction with the key actors in the country’s oil saga. It was a time of intense debate as is expected when the Niger Delta is the topic for discussion. While some felt strongly that a non-violent approach to resolving conflicts could bring long-lasting solutions, others felt that violence was necessary. Chibuzor Eferebo, a book club member said ‘Violence is the language of the unheard’. In his contribution, Prof. Allagoa shared wisdom when he pointed out that there were different approaches to seeking solutions to agitation, as shown by Ken Saro-wiwa and Asari Dokubo. We should attempt to understand those who choose the path of violence while realising that we have gone past the era where violence was needed as a tool for change. He said it is necessary to acknowledge the anger that the current situations raises in us and perhaps write about it, as some people have done, but after that, it is important to have hope for a better future. The moderator, Mrs Uduak Bassey, concluded by reminding attendees of the importance of oiling the wheel of change by deciding to do our best, in our little corners devoid of corruption, which is the crux of the Niger Delta situation. In time, we will have the Nigeria of our dreams. Nigeria like Russia is a petrochemical hegemon within its part of the world. Both countries have populations of 140 million people each and dismal records on Transparency International’s Corruption Perception Index. Nigeria has however had to cope with oil-related insurgencies that have left many thinking the discovery of oil more of a curse than a blessing. Journalist Michael Peel paints a powerful picture of how oil shaped Nigeria’s history; its development, the civil war, the military era and the current 4thRepublic. The book also quibbles about a future that could play out sooner than later. It is an interesting read and a fair appraisal of Nigeria’s prospects as the country approaches its Centenary in 2014. A Swamp Full of Dollars is luridly eye-opening. If you follow the political scene in Nigeria closely you’d know that there are some secrets hidden from even Wikileaks! 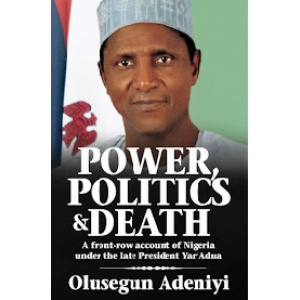 Power, Politics and Death, an exciting new book by Olusegun Adeniyi, provides an insider’s account of the late President Yar’Adua—the man and the president—as never told before. "During his watch, a watchman has no sleep and no respite." 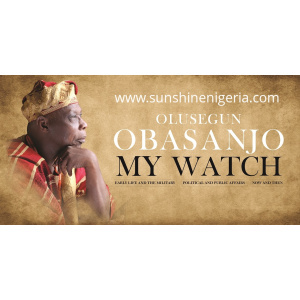 Following in the steps of his previous memoirs, My Command and Not My Will, Olusegun Obasanjo's My Watch is more than the story of the Obasanjo presidency told by the man himself. It is a memoir of a lifetime spent in service to country, of a man who has been destined with the watch, with the vigilance, with the responsibility to his people to speak up and speak out. My Watch spans large expanses of time, from the pre-colonial Owu history, to early Abeokuta and the last throes of an independent city state at turn-of-the-century colonial Nigeria, to the early life of its author, his civil war experience, his stewardship of the transitional government of 1976-1979, the interregnum, his second appearance on the national scene as a civilian president on Nigeria's return to democracy in 1999, the completion of the first civilian-civilian transfer of government in Nigeria's history that inaugurated the Yar'Adua presidency and signalled the end of Obasanjo's tenure in office, and the years hence. The book is presented as a three-volume boxset in hardcase and paperback editions. The book is trimmed at 150x235mm, portrait. The page counts are 506, 672, and 400 pages respectively for Volumes 1, 2, and 3. We present a well-designed, illustrated in full colour where relevant, and factual memoir written by the man himself. In a country where the art of writing life history has been bastardised to serve selfish political interests, the author of a new biography or autography is a suspect, especially with the 2015 presidential election around the corner. So, when this reviewer got a copy of Dan Agbese’s latest work on the former military president, General Ibrahim Badamasi Babangida; Ibrahim Babangida: The Military, Politics and Power in Nigeria, his first impulse was to find out if it was actually a biography or just another hagiography. He rushed to the chapters dealing with issues like the annulment of the June 12, 1993 presidential election widely believed to have been won by Chief MKO Abiola, the controversial Structural Adjustment Programme, Dele Giwa’s murder, etc. He compared the author’s analyses on the topics with his fiery comments on the same issues in the Newswatch magazine in the ’80s and ’90s to see if there were contradictions that would suggest he is an emergency biographer trying to repackage Babangida. But Agbese’s perspective in this book proves to be quite consistent with his previous viewpoint: IBB is a tragic hero. The 433-page book comprising eighteen chapters is a classical case study of a leader who started out with the noble aim of bettering his country but got swept off by the whirlwind of his personal ambition and parochial considerations just when his noble dream was about to be realized.